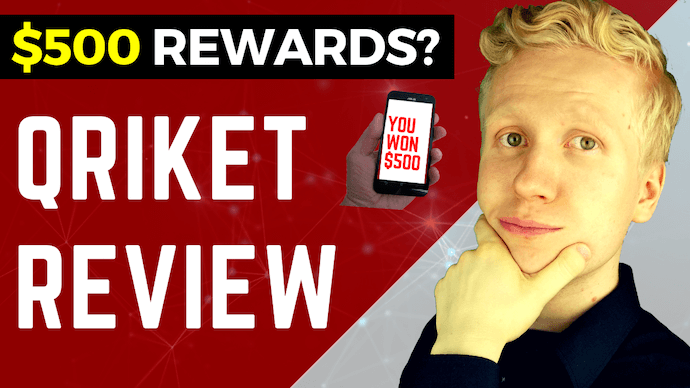 →Qriket Review: Is Qriket a Scam Or Do They Pay $500 Rewards? Summary: Qriket is a mobile application that pays you a little bit of money for accomplishing simple tasks. It similar to many other money-making apps that you can find on Google Play Store and on Apple Store. If you want to make any serious money, I recommend avoiding such apps and going for better ways to earn money that I show you further. Introduction: Easy Money Or a Waste Of Time? If you have read any of our +500 make money online review on YourOnlineRevenue.com, you know well that we give only the truth. If a money-making opportunity is not good enough for you and there are better alternatives, I always say it to you directly. After researching Qriket we came to a conclusion that it's not worth your time since could be making +100 times more money by following my Ultimate Make Money Online Guide. Anyway, I am still going to provide you an in-depth and a comprehensive Qriket review because many people were requesting for this. Are you a freelancer, out of work, or a part-time worker? Are you looking for the various ways and means of making money genuinely online? If I heard you answer ‘yes’ to these questions, you have indeed landed on the right page, I must say. I am here to introduce to you one of the most ingenious ways of making passive income via the online platform. Sometimes it amazes me how far some people are willing to go to promote their apps or referral programs just to make a few extra bucks. The claim that Qriket would be the best way to make passive income is ridiculous and I'm going to show you why. At the end of this review, I'll also show you a better way to make passive income online. That method enables me to travel around the and has given me a financial freedom. Qriket app is an extremely popular smartphone application with 2,5M users that enables you to make a couple of extra bucks. You download it from either in the Google Play or in the Apple app store. The app is basically a game that pays you for accomplishing simple tasks. You play certain games and receive some financial rewards which are dependent on your performance in the tournament. 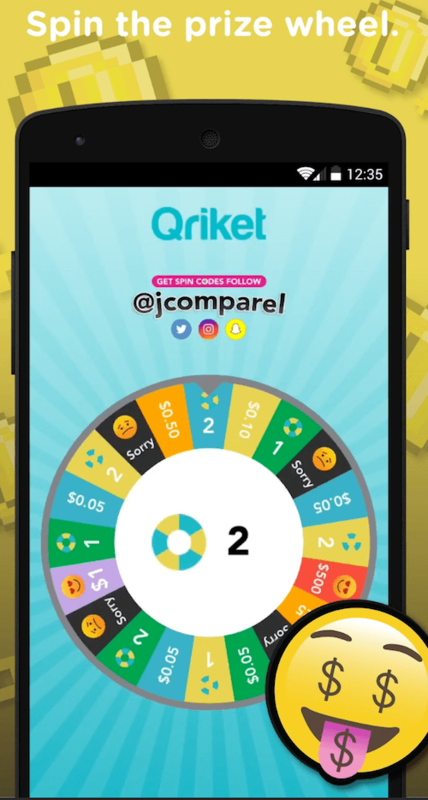 Qriket is a spinning wheel game. Take a look at the image below how it will look like on your smartphone. In Qriket you will spin the wheel in order to earn the rewards. You spin a wheel that will then rotate for some time. With each revolution, the wheel loses momentum and eventually stops. Throughout the wheel are some clear markings. Each marking corresponds to different prizes. When the wheel stops at a mark that bears a prize, you will be entitled to that particular prize. The prizes are also redeemable in cash, not credit or other forms of incentives as is the case with most competing games of this kind. In my personal opinion, Qriket app is only profitable for its creators and promoters. 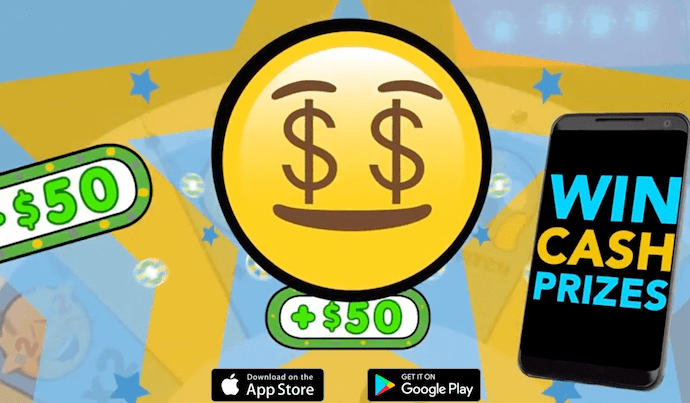 They make big money for the ad revenue that the app generates while basic users will only earn a couple of dollars on average for all the effort. That's why you should follow this Ultimate Make Money Online Guide instead of playing Qriket app. Your earnings will be approximately 100 times bigger by following the guide. Freelancers are by far the greatest beneficiaries of this gaming app. This is because the app is mainly intended for those persons who have nothing else to do to earn a living. Rather than staying idle or watching television, you may opt to play this game as well. You will not only kill time but also earn some revenue in return. Are you employed though not on a full-time basis? This is the app for you! By playing the app, you will be able to fill in the blank spaces that exist in between any two consecutive working sessions. This way, you will be able to accrue some income in exchange for the time you invest while playing the game. Stay-at-home mothers play the crucial roles of tending the home and caring for the children. However, they too have plenty of gaps between the various household sessions. This app also comes in handy at such times. Such mothers may opt to play it and derive some income in return. This is way better than simply sitting there and doing nothing. 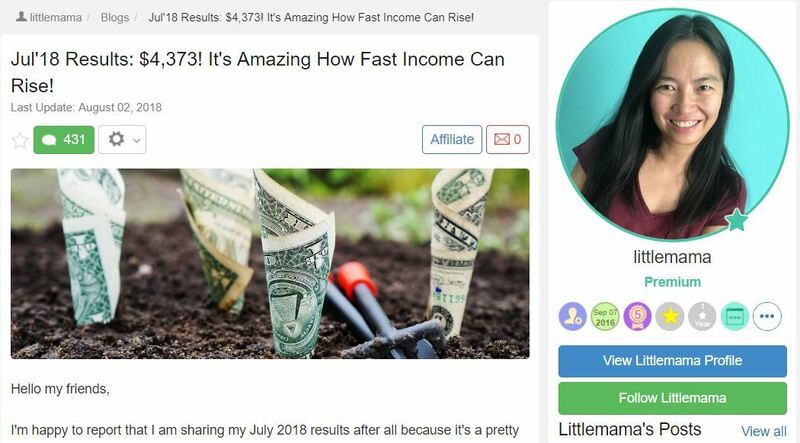 Grace is a stay-at-home mom and is making well over $4,000/month online. Learn more by clicking here or by clicking the image. A person seeking an employment opportunity may also consider playing the game while searching for a place. The game may yield some income which may be used to incur certain incidentals that do arise while seeking employment. These include the costs of transport, the purchase of the right attire, and the photocopy of vital documents, to mention but a few! Lastly, any online gaming enthusiast will also find the software quite handy. It stands apart from other online games in that it entitles you to some income. Other online games are only for enjoyment and bring about almost no financial reward. This means it should occupy a higher place and priority than other kinds of games." Who Should Not Use Qriket? Just for fun, I want to show you how one anonymous person answered the questions, "Who is Qriket NOT for?" In my opinion, his answers are hilarious and a good comedy! "If you are a full-time worker, this is not the game to even entertain the thought of playing. You do not want to land in unnecessary troubles with your supervisor or fail to complete chores in time. The game can really eat away some chunks of your time." "The same case applies to a student. You do not want to skip classes, spend too much of your precious time playing rather than studying, or even diverting your attention from class to the game. For these reasons, the student ought to shun it as much as possible." "Finally, drivers too should never even think of downloading the game. Driving is a very sensitive career which requires maximum concentration while on the roads. The game can take away your eyes from the road and inevitably lead you to cause unnecessary accidents." Note from Roope: Seriously, Qriket is not good for anyone who values their time and wants to have the best life. It's certainly not for people who want to earn good money. They do not require to deposit any money to be able to play the game. The game allows you to win as low as $0.05 and as high as $500 per spin. You have to accumulate a minimum of $25 to be able to withdraw the rewards. All payments are processed via PayPal. Qriket makes money from display ads. So when a user clicks any ad on purpose or accidentally, Qriket earns always a small commission from the advertiser. With +2,5 million users their earnings quickly add up into a huge income. The drawback is that for a player the chances of making a good income are almost 0. NOT really. The app has some issues. However, on the whole, it still can't be considered as a blatant scam because some users have received their rewards. If you start using this app, don't expect much. This is to avoid those disappointments that many have experienced when the app didn't pay them. Some users are claiming that Qriket is a scam because they didn't receive the payments and the support is not answering their messages. Those are certainly big red flags. I'm not surprised that Qriket has received only 2 stars out of 5 on Apple Store based on user reviews. As you can see, most Qriket App users give it only 1 star out of 5 on Apple Play Store. Qriket certainly isn't worth it. It may be "free" to use in a sense that you don't need to pay any money for it. However, I personally think that time is even more valuable than money because when the time is used, you will never get it back. You can always make more money by using one of our recommended opportunities but do you have a way to create more time? Some people argue that they can at least earn $0,5-5 for this app and it's much better than $0. That may be partially true but $5 is much worse than $5,000 that you could earn pretty much guaranteed by following my step-by-step guide. That being said, I don't leave you there just with these "bad news" because I also have "good news". The good news is that even though Qriket doesn't pay well, there are still 100's of great ways to make a living from home and I'd be more than happy to help you to get started. I'm sure you'd enjoy having the same freedom that I have when I make money online. That's why I'm willing to help you so that you could have the same privilege as well. There is a PROVEN 4-step formula that you can use to earn money wherever you go. It's simple to understand and it doesn't cost anything to start using it. The earning potential is great in the long run (+$10,000/month). Your earnings will depend on the effort that you put in. The more you are willing to learn and take action, the more you will also learn with this 4-step formula. I prepared you a comprehensive +9,000-word guide to help you to get started and show the way to start earning money online. In the guide, I also explain how I will be helping you when moving forward. Read the money-making guide here, bookmark the page and take massive actions. You can share it with all your friends and family members who might be interested earning money online as well. What kind of experiences do you have with Qriket and the other similar money-making games? Have you experienced success with them and made a good income? Learn the BEST way to earn money online by clicking here!